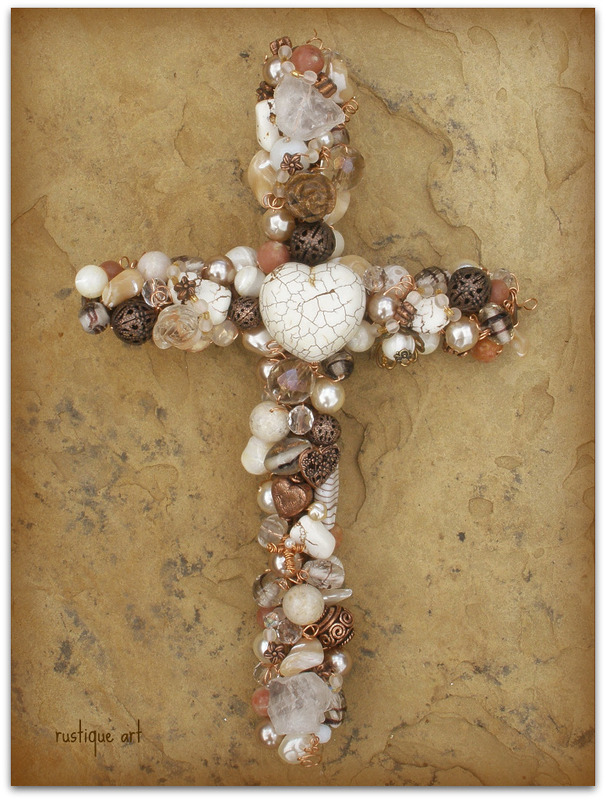 Handcrafted out of Texas Barbed Wire, this hand sculpted barbed wire wall cross will look stunning in your home, patio or garden area. Rustique Art Barbed Wire Crosses can be displayed outside and will withstand the elements of any season. 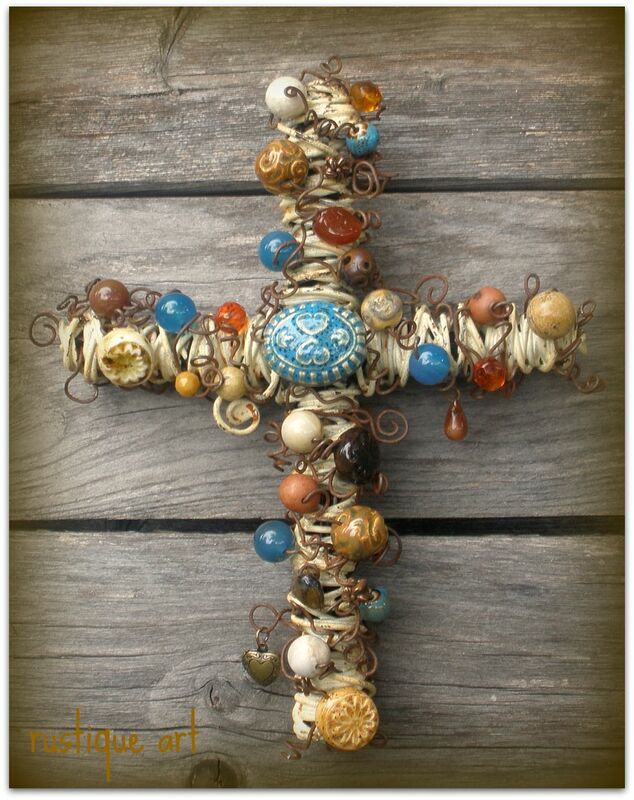 The exposure to rain and sun will age your cross giving it a more “Rustique” look.Each cross has a hanging loop so that your cross is ready to display as soon as you receive it. Remember this is real Barbed Wire, it is strongly recommend to wear gloves when handling. Scripture stone shown in image was made available by Stone Art USA . To see more photos of barbed wire wall cross designs; visit my portfolio on flickr. All Barbed Wire Designs have been discontinued. Hand sculpted out of wire, a Rustique Art beaded wire wall cross can be made to order to match any decor. Each and every bead is sown on by hand. Each cross is made with a hanging loop so that your cross is ready to display as soon as you receive it. To see more examples of beaded wire wall crosses; visit my Beaded Wire Cross portfolio on flickr. 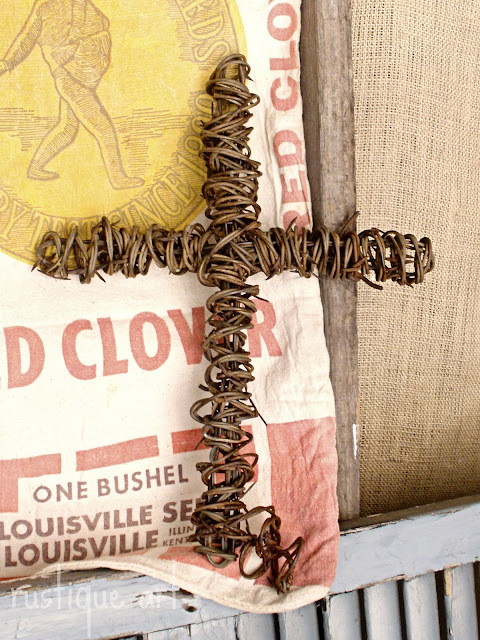 For those who prefer a more shabby chic look with distressed paint and twisted wire, there is the Cottage Cross. Gobs of luscious beads and twisted rusted wire for the look of grapevine, chippy distressed paint and lots of little dangles. Hand sculpted, painted and distressed, hanging loop added into the design for instant addition to your cross wall collection. To see more examples of the Cottage Cross design; visit my portfolio page on flickr.